Ah, the perfect bowl of oatmeal – a thing to behold. When we’re sick, craving comfort food, or just want something extra hearty for breakfast, this is our go-to meal. 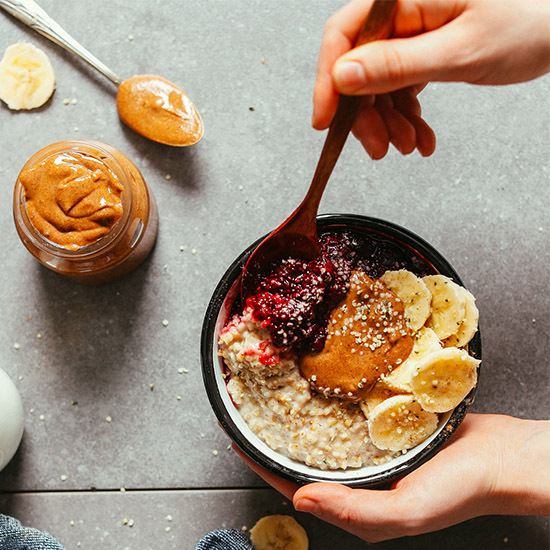 In the hundreds of times we’ve made oats, we’ve found some tricks that elevate the texture, flavor, and tenderness, and we’re stoked to share those with you today. Shall we? This recipe requires 4 ingredients, 1 pot, and simple methods to prepare. Our top tip is to SOAK. Now, if you can’t find the time to soak your oats ahead of time, that’s fine. We’ve got shortcuts for you in the notes. But if you know you’re having oats the next day, the best way to get dreamy oats is by soaking them overnight in cool water. Soaking not only softens the oats, but it also makes them more tender, quicker to cook, and easier to digest. In a side-by-side comparison, we found that unsoaked oats lacked that fluffy, creamy texture soaked oats provide. So, from here on out, we’ll be soaking. Once they’re soaked, it’s time to cook. Simply bring oats to a low boil. Then reduce heat, cover, and simmer until tender. Lastly, add in your sweetener of choice, along with cinnamon and flaxseed. 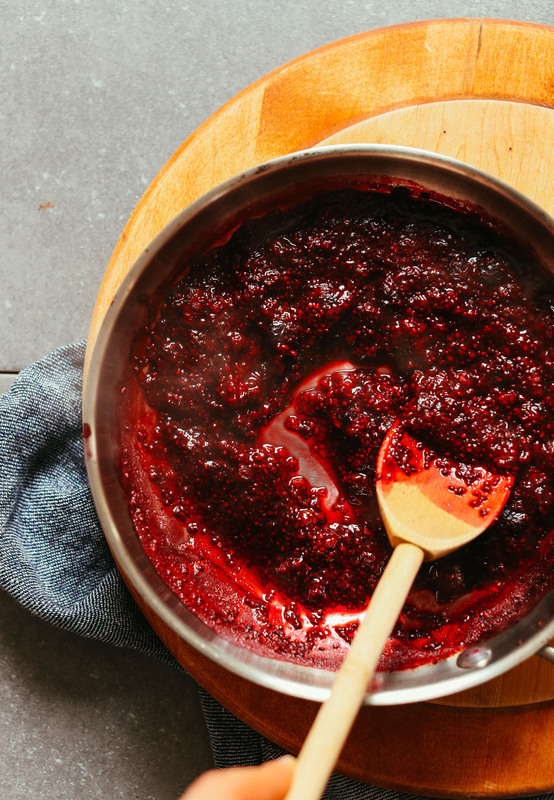 For toppings, we can’t resist our go-to Berry Compote (we add chia seeds at the end for thickening + healthy fats! ), hemp seeds, nut butter, and banana. Seriously dreamy. 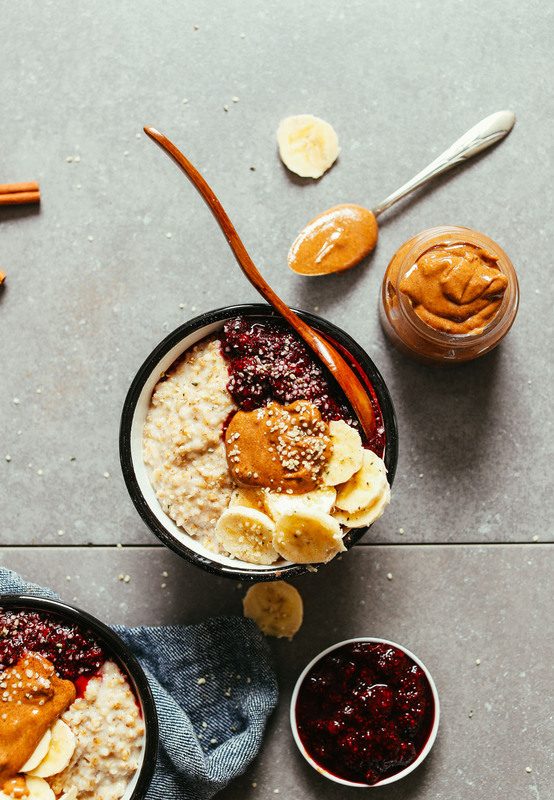 These oats make the perfect weekday or lazy weekend breakfast. They’re super versatile as well! In the fall, top with roasted apples. In the summer, go with fresh berries or compote. In the spring, go with oranges! The options are endless. 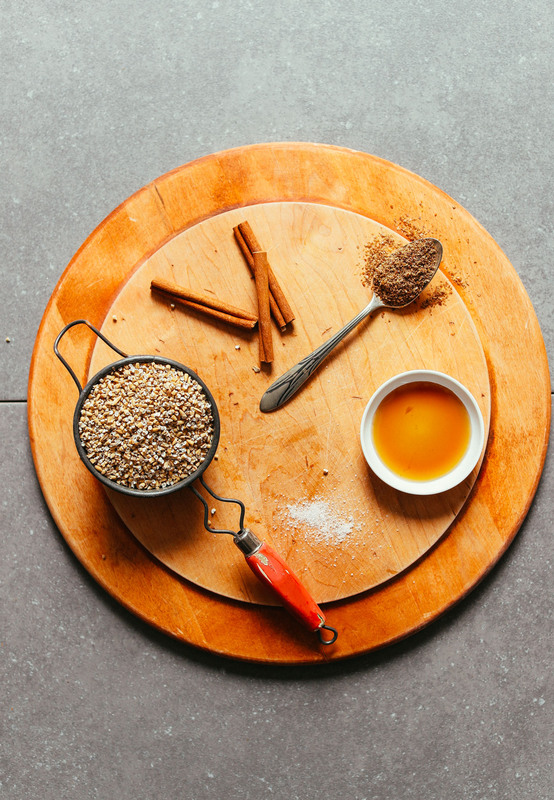 For more oats recipes, check out our Brown Sugar Pear Steel Cut Oats, 5-Ingredient Vegan Gluten-Free Cookies, Everything Breakfast Cookies, Pumpkin Pie Oats, and Peanut Butter Overnight Oats. *If you don't want to soak your oats, simply bring listed amount of water to a boil in a saucepan. 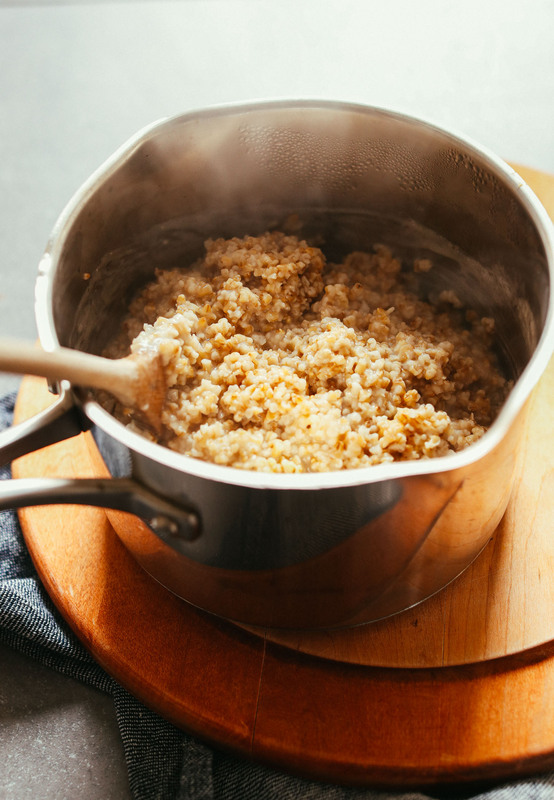 Once boiling, add oats, stir, and reduce to a low simmer. Cover and cook until tender - 15-20 minutes. *Prep time includes soaking. If not soaking the oats, the prep time is only 5 minutes. *Nutrition information is a rough estimate based on 1/2 of the recipe calculated with maple syrup and without optional toppings. Wow! So yummy. You were right about soaking the oats overnight. They really melted together the next morning. Thank you! Great recipe! I’ve only tried it plain thus far but I intend to try it for supper with savory flavors rather than sweet. I like oatmeal with sauteed onions and mushrooms (and a glass of red wine). If I put them to soak in the morning before going to work, it will be about 10 hours before I can cook them in the evening. Would this be too long of a soaking time? PS: I soaked the oats in 1 cup of maple water and 1 cup of filtered water. I also added sliced almonds to the cooked oatmeal. Thanks for all the great tips! I really enjoyed this recipe. Soaking the oats really made them creamy so I’ll be using this method from now on. I didn’t rinse the oats after soaking. I used almond milk, a dollop of crunchy peanut butter and cinnamon. Such a yummy breakfast this morning along with my healthy, homemade shake! Delicious and filling. These really are the BEST oats!! Love that berry compote! Can I use rolled oats instead of stellcut oats?? 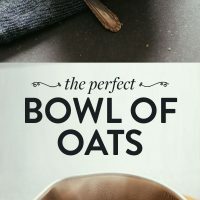 Do we need to soak the rolled oats overnight is using it for this recipe? I made this with the Bob’s Red Mill Quick Cooking steel cut oats from Costco. When I have made them in the past they’ve been crunch and not that great. Anyway I soaked them this morning for about 4 hours and wow, what a difference!!!!!! So creamy yet a little but creamy. Anyway, I will Always Be Soaking forever now. Oh, and I added a little earth balance, raisins, cinnamon and nutmeg, soy milk and maple. A veganised version of a school morning favourite my dad use to make us. Anyways, thanks again as always Dana!! I’d never made steel cut oats because I thought they took forever to cook! I’ve made these twice now and they are SO GOOD. The first time I made them on a Saturday afternoon but I forgot this weekend, threw them in to soak Sunday night and whipped them up before work on Monday. Steel cut has a way better texture – wow! Ps I am eating them as I write this!! These oats are amazing. I made them a few weeks ago and my husband went crazy for them. He talked about them all week so I took the hint and made them again. Our mornings have become a bit hectic with a baby so I double the recipe and throw them in the slow cooker, viola breakfast for the week! The texture is super creamy and hearty. So simple and seriously one of the best oat recipes ever! Before soaking, wash them off repeadetly with water. Soaking the oats can be done 1/1 with water. When you cook them the next day in the same water let them go op to boiling and afger reduce heat to a minimum and check with your ear if it’s still boiling. No need for salt as they’re so tastefull already. Go minimal with this recipe, try to avoid adding sugars, just add mild and fruis as you like, no cinnamon as it’s to overwelming. Just enjoy the ceunch of each oat. Berry chia seed jam and also some vanilla coconut milk ice cream. Yum! Yay! Glad to hear it, Allison! Hi Can I use rolled oats instead of steel cut oats? Delish! I added only vanilla flavoured coconut milk to the finished product. Very good. I’ll try adding sun or peanut butter next time and/or maybe some nuts & seeds. Love that it makes enough to stash in the fridge for next time. Love your recipes…thanks for another great one! I’ve heard that both can work! A friend of mine slow cooks hers overnight. I think digestion wise both are good. Soaking ahead of time probably isn’t necessary if slow cooking. Hope that helps! Thank you Dana, I checked with her and she slow cooks them for an hour, stirring ever ten mins. I guess I will have to experiment! Thanks for the inspiration. I add a little fresh nutmeg grated,walnuts,pecans,raisins or prunes in the final stage of cooking. Variety of fruits,spices,honey to add. I love the peanut butter, really makes the recipe come together! Do you have an alternative though for a peanut allergy? As I want to pack this for my daughters lunch but they have a strict no nut rule! Any nut butter will work. I prefer almond butter to peanut butter. Great question! 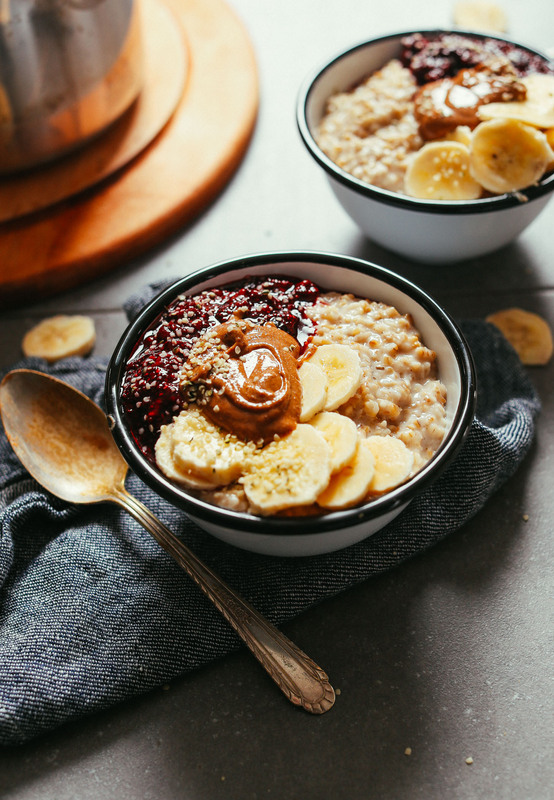 The benefits of steel cut oats exceed the benefits of rolled oats due to the way they are processed and they retain more fiber and protein. Hope this helps! Yum! This does look like the perfect bowl of oats. Can’t wait to try this! I like that you are soaking the oats which I do regularly. I always rinse the oats to rid of the phytates and then use fresh water. Any reason you are skipping this step? Perhaps the oats are creamier, but the phytates are still present, yes? Do you use this method with old fashioned oats as well? I LOVE good gooey oatmeal and found out I can make it in my rice cooker. Talk about easy, I just dump in oats and water, seal the lid and set the timer. I also add maple syrup and cinnamon before cooking. YUMMY. Never considered topping with banana or jam. Will try this next time. I haven’t tried soaking overnight, though I do soak for an hour or two in the morning. I’m looking forward to trying the longer soak. However, I always use FOUR times the water as oats (for the two of us I use 1/2 cup oats and 2 cups water). Does this really work with just twice as much water as oats? I suppose it’s preference, but I like using less water so they’re a bit more toothsome and less watery. Then I add dairy-free milk at the end of cooking to amp up the creaminess factor. It’s not necessary to refrigerate the oats while soaking, correct? Mmm, yum! I mostly prepare rolled oats in the morning for convenience, but I do acknowledge the superior texture of steel-cut. When I do make steel-cut, I cook them overnight in a slow cooker, but I would love to try making them fresh on the stove-top one morning. The main inhibitor to this breakfast is the time it takes to cook steel-cut oats, about 30-40 minutes according to the package instructions. Soaking is a fantastic idea to speed cooking time. Thanks for sharing! When I remember the night before I soak the oats, it does make a world of difference. Your suggestions of toppings and sweeteners look great and are begging to be tried for breakfast tomorrow morning. Now – I’m off to soak my oats! Hope you love it, Katherine! Beautiful! These look so yummy. And there’s no need to drain the soak water or rinse the soaked oats? Just cook directly in the soak water? This is often why I skip the soaking, the extra step of rinsing, unscrewing the screen on the jar with my arthritic joints, another container to clean . . . not worth it in a rush. If it’s not necessary, soaked oats are in my very near future! I don’t find it necessary! Hello. I have soaked for years and never drain or rinse. My favorite creamy steel cut oat recipe advises to toast the oats before cooking. With that, and this soaking method… I’ll be UNSTOPPABLE! I usually don’t mind spending 30+ minutes cooking them because I’m cleaning the kitchen as they cook, plus I make a big batch cause the freeze AMAZINGLY. Oats are so great! Thanks for this recipe and topping ideas! Smart! Thanks for the tip. No problem! Thanks for doing what you do! Should I use almond milk? Ive made steel cut oats before and i love them. I soak them also…. I add bananas.. Chopped dates… Flax and chia seeds…..cinnamon… Dash of salt… Slicded almonds…. In almond milk or water. Blueberries are delicious in them also. Next Im going to try pear or apple I have no doubt it will taste wonderful!